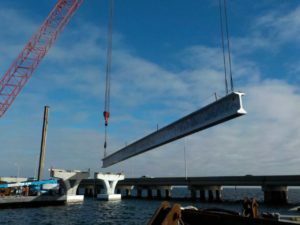 The first of more than a thousand “Florida I-beams” have been placed for the new Pensacola Bay Bridge. 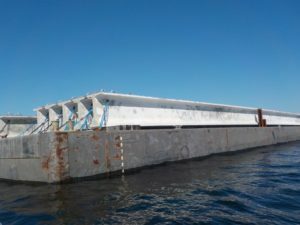 The beams connect the trophy pieces one-to-another and will eventually support the bridge deck and riding surface. 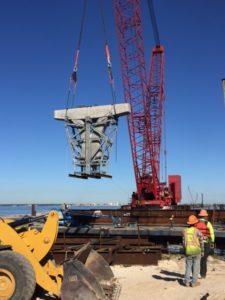 Construction crews continue to drive piles and place trophy pieces for the new Pensacola Bay Bridge, but a new milestone will be achieved soon with the placement of the first concrete beams. The construction team reached a milestone Thursday, Oct. 26 with the setting of the first "trophy piece." 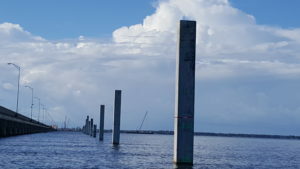 An increasing number of concrete piles, many of varying heights, adorn the west side of the Pensacola Bay Bridge. These piles will eventually form the foundation for the new bridge.